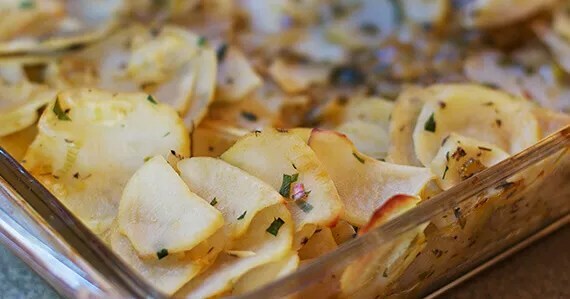 This recipe is a great alternative to scalloped potatoes, which are traditionally very high in fat. Put the leek, onion, celery, shallots, and garlic in a large dry saucepan over medium heat and cook, stirring constantly, until the onion starts to brown, about 5 minutes. Stir in the granulated garlic and granulated onion and cook for 2 minutes. Stir in the broth, increase the heat to medium-high, and simmer for 10 minutes. Add the potatoes and stir until well combined. Decrease the heat to low and cook, stirring constantly so the potatoes don’t stick together, until the the potatoes are translucent, about 15 minutes. Remove from the heat and stir in the parsley and thyme. Transfer to 13×9-inch baking dish and bake uncovered for about 25 minutes, until the potatoes are golden brown and fork-tender. Serve hot.